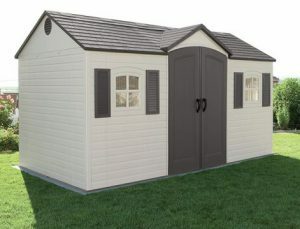 Innovative design on a grand scale with the most stylish of appearances produces Lifetime’s 15 x 8 feet garden storage sheds – plastic albeit technically advanced through High Density Polyethylene delivers the low maintenance benefits meanwhile the huge footprint caters for an abundance of storage solutions. We plucked up the courage to pull our last dilapidated rotting wooden hut down and exchanged for resin, simply through the attraction of resolving maintenance issues. A fun hose down once the grime becomes visible regards their minimalist duty to maintain a spotless shine. If you’re looking to bypass the annual upkeep grind and relish the prospect of assembling a stature of elegance in your surroundings meanwhile spacious dimensions to serve a bulk of outdoor storage requirements regards priority, Lifetime’s 15 footer is receiving awesome feedback, worthy of a full inspection. Lifetime’s masterpiece expanding 15 ft long by 8 ft deep parades the clean lines of desert sand presented in architectural style. The semblance of a slate roof, wide central double doors and fashionable squared windows accompanied with shutters either side exhibits the most picturesque of appearances. This facility represents one of Lifetime’s largest storehouses displaying this particular architectural design by means of centred doors across the length. The smaller option regards an 8 x 10 footprint for those looking for a tad smaller dimensions. 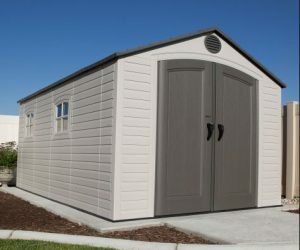 Shed Ranges provides a visual glance of all the low maintenance resin storage sheds reviewed on this website, represented within their ranges. 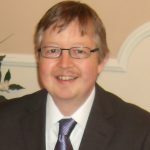 I’ve been fortunate to read a whole range of reviews from dedicated people willing to provide feedback across a varied selection of sales sites. After having their shed stood in the garden in excess of a few years really does provide proof for how Lifetime sheds stand up to the weather elements. A whole plethora of phrases like watertight, waterproof, sturdy build quality, low-maintenance, no leaks shines through expressing positivity. 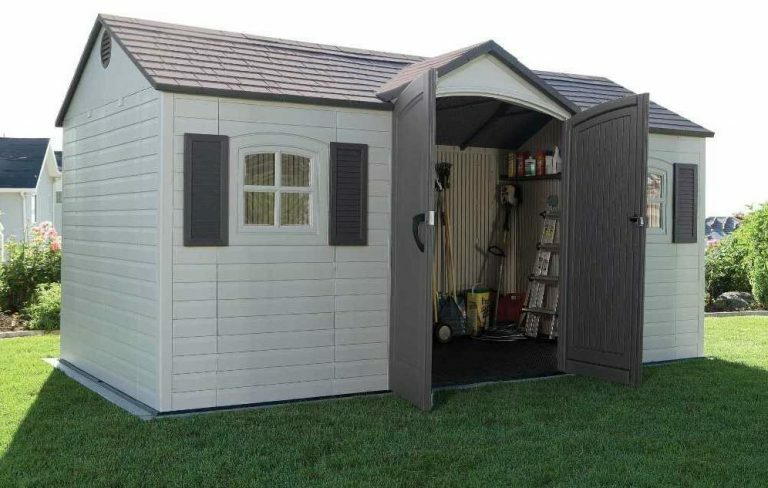 The quality features inclusive to Lifetime sheds are expressed with high appraisal too, providing an abundance of confidence for shed searchers. The secret to building the perfect standing construction regards building from solid level foundations as discussed in the Assembly Section below. The majority opt to lay concrete foundations for this particular model due to the sheer size to accomplish heavy duty serviceability. Those who comply to the foundation stipulations write wonderful reviews, it all becomes apparent when you commence constructing. Those who disregard the rule, usually struggle. The only downside regards the time they take to assemble however construction is made straightforward for two people to accomplish, it’s just a matter of working your way through the order of instruction steps. Lifetime’s facade exhibits the wondrous glow of a desert-sand shade, merging effortlessly against the grey slate roof and brown tinted doors, vents & window shutters resulting in architectural splendour, destined to complement any home-yard’s surroundings. The facade arrives in sheet form, assembly requires interlinking with the next wall sheet, adjoining the steel infrastructure whilst simultaneously interlocking with the floor, then securing into place with high grade metal screws. Manufactured from High Density Polyethylene, Lifetime’s double walled formation delivers rigidity. 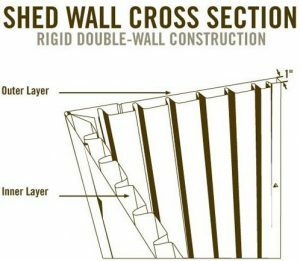 Unlike single skinned walls being susceptible to the unsightly appearance dents display, this rigid wall construction prevents the occurrence of dents, chips and peeling to the facade. The molding process creates a semblance of attractive horizontal wood panelling to the outer-skin whilst intricate details of a wood-grain texture are embedded throughout. Stabilising the resin with UV protection armours the make-up with extra toughening to ensure the polyethylene resists problems associated with the effect sunburn attack delivers to unprotected plastic. Technical advances have evolved to provide defence against colour fade issues and surface splitting when subject to sun-ray pressures. Although Lifetime’s delightful appearance captures attention, the low maintenance advantages are the pure benefit. The weatherproof makeup resists deterioration through rot & decay, requiring no future attention relating to re-coats of paint nor varnish. Lifetime sheds are manufactured easy to clean, a quick hose down brings back the pristine condition in minutes. Unwinding the garden hose delivers our convenience, most prefer a once a year pressure-wash whereas others softly scrub with a dash of cleaning detergent. Lifetime’s polyethylene is wholly re-usable, environmentally friendly and doesn’t contaminate the ground with harmful chemicals. Steep roofs bring peace of mind with regards to efficient rainwater drainage. This Lifetime facility delivers an excellent high pitch in an apex design accompanied by an additional pitch above the double doors to generate an abundance of headroom height upon entry. Manufactured out of impervious polyethylene provides a weatherproof capping, efficacious in combating decay. The double skinned structure ensures robustness meanwhile attractively molded to create the presence of a slate tiled roof. 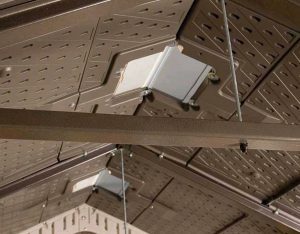 The roof panels tie around a steel framework and secure with screws. Under-girding the roof infrastructure regards 5 A-frame steel trusses spanning across the apex rafters inside delivering reinforced roof support for heavy snowfall. The roof adequately extends beyond the facade ensuring there’s no admittance for rainfall where the walls abut, nor any chance of water puddling on top due to the steep angle pitch. Lifetimes dual-skinned weather-resistant topping is immune from weather deterioration, thereby a future devoid from forthcoming roof replacements. Quite the opposite of roofing felt’s rapid structural demise, requiring frequent re-felting projects once damp conditions attack. Polyethylene on the other hand remains unaffected. It’s quite rare to find a metal shed containing a built-in floor. Problems associated with puddles appearing on the inside, outside debris wafting through the shed base and crevices for pests to enter regards one of the reasons we moved down quality plastic sheds avenue owing to the integrated floor being a significant part of the construction. This 15 x 8 feet floor is supplied in sheet form, interlinks with adjoining sheets producing the base expanse. A thickset bed of polyethylene molded into an anti-slip grip-able surface containing resistance to solvents and oil stains provides convenience for a quick wipe over. Purposely designed into a toughened thickset base gives Lifetime floors the durability factor. Whether you’re driving in gardening machinery, rolling in a mobility scooter or wheeling in heavy duty lawnmowers, the make-up’s specifically designed to subsist the stresses. These hard-wearing credentials will only live up to their description however if the preparation of the recommended foundations have been adhered to. Anchor placements embedded within the resin floor require anchor bolts (not included) to enable rigidly grounding the shed onto the foundations, increasing wind resistance levels and stability for protection against adverse weather. This facility laps up daylight through two poly-carbonate windows on either side of the double doors besides six impact resistant skylights embedded within the roof, delivering a profusion of daylight to illuminate the interior. A copious amount of headroom is generated internally by virtue of the steep apex overcoming a bent over procedure during entry on account of the high arched double doors meanwhile eliminating a hemmed in feeling once inside. Couple the generous height with 15 x 8 feet dimensions, there’s one spacious amount of storage expanse inside. Capable of generating a garage clear-out with ease whilst organising space indoors by removing outdoor gear to where you need it most – outside. Whether you’re wheeling in lawnmowers, driving in on a mobility scooter, a tractor-mower, storing heavy equipment, long handled garden tools and ladders, barbecue equipment, parking bikes & kids toys or accommodating patio seating and accessories, there’s ample room either side of these double doors. This design delivers a smart solution to store mucky gardening gear one side, clean patio furnishings the other. 2 shelves, 2 peg strips inclusive of metal hanging hooks and 4 corner shelves are included. Many opt to install stand alone shelving to utilise the shed’s height in accommodating weighty storage plus stacker boxes are a great storage solution too. This is what we did, it’s surprising how much stuff a shed is able to hold when making use of their internal height. Although this shed is designed with windows that open half way, another impressive feature regards integrated ventilation. This Lifetime shed incorporates air-vents into either side generating a fresh air current to circulate the interior, preventing condensation building up on the inside and a sweaty atmosphere developing during the warm season. The doors manufacture regards a twofold lining of polyethylene, crafted to exhibit wooden styling meanwhile steel reinforcements enhance operation & security. This resin constitutes equivalent impervious and weatherproof advantages the roof and walls comprise. The doors opening dimensions are 56 inch width, 76 inch height as shown below in the measurements section. The doors wide access and high arch deliver spacious entry, benefiting storing heavy gardening equipment and wheeling in weighty lawnmowers. Two latches retain the closed position of the left door, located on the internal side they slide into grooves situated at the top section of the architrave, the other furrows the floor’s entry threshold. Full length steel hinges function the doors swing surplus to being galvanised, thereby preventing corrosion. 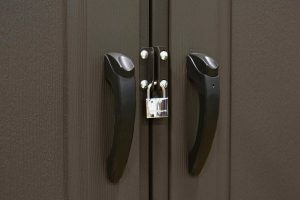 Decent sized handles with metal latches provide an easy grasp whereupon a top-button requires pressing to operate the latching mechanism to gain access. When both doors are closed, two clasps align together enabling padlock security. Sadly there’s too many websites only interested in selling, most seem to miss out the priority rule regarding base preparations. All plastic sheds require solid level foundations. Conforming to a level base paves the way to a straightforward assembly, simplifies the panels plumb alignment, ensures the delivery of a perpendicular stance avoiding leaning stresses on account of the roof weight applying equal force to all shed sides besides generating the doors true alignment and swing. A solid substrate ensures the anchorage receives firm groundings. 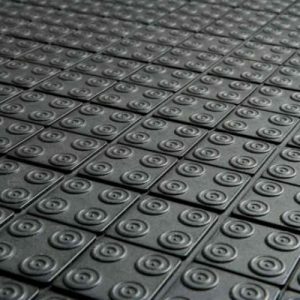 These resin floors are specifically designed to survive heavy duty storage pressures if the are laid on a solid flat surface. Foundations can be wood, paving, asphalt or concrete, making sure they are level. 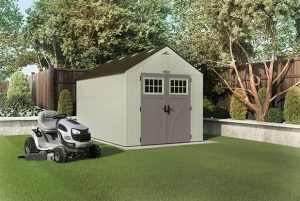 For a shed this size it’s probably recommended to prepare a levelled concrete or asphalt base raised slightly above the ground to allow for drainage. A few who initially opted to lay a wooden base now wish they had chosen concrete, it’s purely down to the shed’s sheer size & personal preference. Although Lifetime estimate a 6 hour build, these dimensions take the majority into the second day. This is a huge shed and most of us are novice DIYers. There are a few jobs like fixing the door hardware etc that can be done prior to the build which does quicken construction. Resin sheds require two people to construct, one supports the panels whilst the other secures. It’s important to read through the instructions beforehand to become acquainted with the process. A step ladder is required for securing the roof’s infrastructure whilst movement is necessary around the entire perimeter of the shed. Many opt to use a power screwdriver however it’s advised to set it on a low torque to prevent jiggering up the thread, screws just require being nipped up tight. Otherwise, household tools construct all Lifetime sheds. Another few tips relate to applying a spray of WD40 oil or washing up liquid to aid interlocking the panels whilst ensuring the panels are kept out of the sun prevents expansion before fitting. Once the panels are all lined up, you’re rolling. Upon finalising construction, advice regards firmly anchoring the facility down through the indentations presented within the floor. All these tips and rules are what we picked up prior to construction which aided our process into a straightforward assembly. Common-sense really. There’s some tough opposition entering onto the market at present. A resin composition is becoming the favourable alternative for those wishing to ditch maintenance duties. Having said that, not many manufacturers incorporate centred doors across the length like this facility presents. Supposing wishes are to exhibit accents of architectural style to your surroundings, Lifetime’s 15 x 8 footer emits oceans of character. This huge footprint delivers a smart two sided storage solution, enabling to organise the home whist delivering a garage clear-out with ease. Reviews speak volumes and this facility blossoms. Virtually maintenance-free, Lifetime’s weatherproof facade withstands weather depreciation, never requires painting nor re-roofing, merely the minimalist duty of a quick wash down every now and again to maintain appearances concludes the upkeep, and it’s easy to keep clean. Lifetime claim their sheds surpass the qualities of all their competitors, there’s a claim! however this is one heck of a popular model, inclusive of a 10 years limited warranty and receives fab feedback with an abundance of thumbs up. Appreciate your inspection of this popular storehouse. 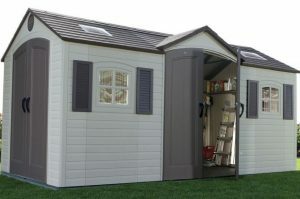 Feel free to ask about any weatherproof shed queries or relay suggestions in the comment box. Please share Lifetime’s 15 footer. Thank you! 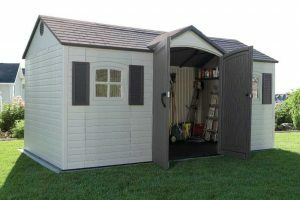 Quality Plastic Sheds look like a great solution to storage of all the gardening tools. I had that problem until I bought a cedar-wood shed. It cost a lot more the plastic shed advertised. The manufacturer installed it so that added to the cost. The annual maintenance of protecting it with stain and water shield is also costly and time-consuming. I live in Canada where winters are harsh, cold and snowy. Do you know how these plastic resin sheds stand up to freezing cold temperatures? Do they crack or warp? 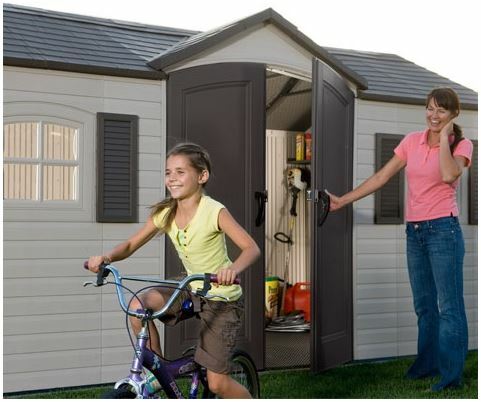 Thanks for visiting to read about Lifetime’s garden storage sheds. There’s no doubt to champion a garden shed composition would be to constitute the walls from deep treated cedar wood then topped with a resin roof similar to the apex on this shed then have it professionally installed on a raised bed of concrete but like you say this takes the budget into another stratosphere altogether yet still requires an annual coat of varnish in order to keep nourishing the wood. Like anything there will be a limit to what plastic will cope with before it starts to diminish however Lifetime have created their High Density Polyethylene that makes up the facade & roof into a double walled skin that’s ribbed on the inner surface to for rigidity purposes to ensure stability. Blended into the polyethylene at the initial stages of manufacture regards the compounds that toughens the composition to resist fractures appearing during freezing conditions and prevent sunburn attack bleaching the colours and splitting the manufacture during hot summers. I have read one review regarding a door becoming warped after directly facing the sun for about a year over in Texas but I haven’t read one review regarding the composition becoming cracked when exposed to below freezing conditions. We live in the UK, therefore weather conditions aren’t too harsh, our problem regards constant rain throughout all seasons to which resin delivers the perfect make-up to withstand decay related issues especially when damp conditions attack. 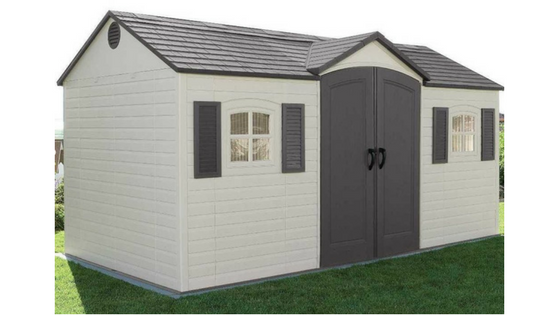 Sounds like you have the ideal shed made from cedar Ed – thumbs up! This plastic composition on the other hand fits most budgets, complements the home-yard, delivers the same results further to escaping maintenance duties. 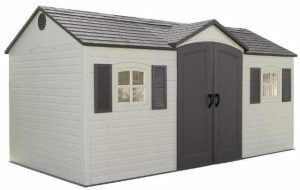 Yes, I have been looking at and for sheds for quite some time. Now at the pouring concrete stage as I think it will last longer. This one is quite large and looks like I could use it as a workshop as well…I love tools and I love DIY projects, so this might be perfect. How simple or hard are these to assemble? My oldest son will be visiting me in October (when it is definitely cooler here), so maybe that would be a good time to get busy with a shed. But, he is here for a week, and I don’t want him spending his entire week helping with a shed. Is this time consuming, or can it be done in one day? 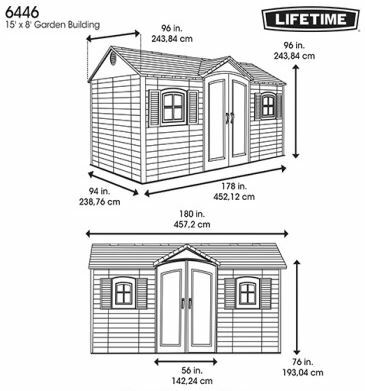 Thanks for visiting to read about Lifetime’s garden storage sheds – plastic in manufacture. I agree, concrete is the longer lasting of materials when compared to wood, concrete provides an ultra hard wearing surface to survive the stresses of weight equipment rolled and stored upon plus the solidity delivers ideal foundations for enhanced anchorage. If you’re planning a workshop combined with storage, the central doors provided through this lifetime’s architectural design allows for storage one side of the doors, workshop space the other, fab solution for combined services. The larger the shed, the more time they take to assemble. These 15 x 8 ft dimensions make this facility quite large, for novice DIYers. I would estimate a couple of days to construct. The main priority is Solid Level Foundations because when you’re building from a level base everything aligns plumb for a fast efficient assembly, I just wish sales sites would pass on this information. The writing on this post is just as amazing as the shed itself. Very thorough, well-written, and now I know exactly what to expect with the garden storage shed. I love the desert sand color. I think it makes it look elegant in just about every sense of the word. One thing I was wondering is whether or not this shed comes with a warranty? Also, how many people would you recommend to assemble a shelf like this and are there any services that could assemble/install the shed for you? Thanks! Yeah, these Lifetime sheds look like pretty houses situated at the bottom of the garden don’t they, they’re such a nice architectural design. 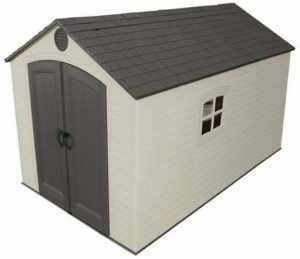 Lifetime sheds are backed by a 10-year limited manufacturer warranty. Assembly takes 2 people. We found one holds the panels in place whilst the other screws in to secure them when building our shed. The walls are fine on your own to be fair but once you get to installing the roof, it’s so much easier with a second person applying support. There are some companies out there who do install, yet these are usually freelancers. I have known quite a few who gave the job to a couple of local handymen to construct for them. The main thing is preparing solid level foundations for the shed to sit on. Done this way you find all the panels line up for a quick and efficient build. The choice is wood, concrete or paving, just make sure it’s level, that’s the main thing. That is a good size garden shed! I really like it, as I can put everything in there! I am selling my home right now in Dallas and moving to Florida. 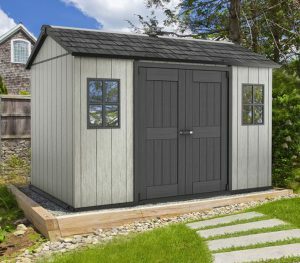 I am considering homes without a garage, so have been looking for a bigger shed to store my tools, etc in. And I do have a lot of tools 🙂 Will this type of shed last in the Florida sun? Do you think it is big enough to use as a workshop inside? 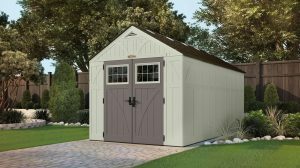 Thanks for calling in and reading about this Lifetime Shed. Yeah, you have a 15 ft x 8 ft footprint with a generous height of 94″ generating plenty of room for a whole host of storage. We decided to install free-standing shelves in ours and this does take storage options to another level altogether as you are using the height. This is a preferred option for many as the weight of storage isn’t an issue. So there’s oceans of room for tools and gardening equipment, not forgetting the patio seating and accessories etc. Lifetime are well established in the USA and make these sheds suitable for all weathers including driving rain, snowfall and sun. The resin mix is UV stabilised to resist cracking and fading in the sun. Size wise for a workshop, this really does depend on how much storage you’re wishing to accommodate plus using as a workshop, this really is a case of measuring out and comparing with your garage for instance or maybe think about 2 smaller sheds, one for storage, one for a workshop.